Devlok is the first attempt in man’s civilized history to bring the Epics of Hinduism alive through a Theme park. Devlok is unique blend of architecture, technology and spectacular Story telling where Entertainment and Enlightenment is ubiquitous with underlying theme of Spirituality. Devlok is being developed at tranquil location in an extent of 38 acres of land, at the Foothills of Tirumala (having back ground of Sacred 7 Hills with look alike face of Lord Balaji). While travelling on road to Tirumala, Pilgrims can have splendid aerial view of Devlok. When you enters Devlok through Main Entrance, you will finds the threshold of a totally different world. The entrance is designed in a way to inspire the feelings of awe and wonder for the Gods within. The Temple like entry gives the feeling akin to that of entering the Sanctum Sanctorum of any Temple. But this entry also keeps the practical aspect in mind, for it serves the purpose of other facilities of the Theme Park like ticketing. administrative and maintenance offices etc. 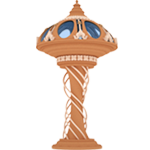 18 Shakti Peethas & 12 Jyothir Lingas will be placed in the structure designed like the traditional Indian Lamp. 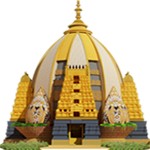 10D Dashavataram Virtual Reality Arena (In Sync with Theory of Evolution), Venkateswara Mahatvara Hydraulic Boat Ride, Viswakarma – Temple Museum, Viswam – Vedic Cosmology Experience Dome Theatre. In Vishnu Pancha Bhumika Mandir various Forms of Sri Maha Vishnu will be displayed. Here we will explain various stages to reach Sri Mahavishnu, namely Archana, Gyana, Vyuha and Antharyami, through pictures, and Art forms. In Mahadeva Pancha Bhumika Mandir various Forms of Mahasiva will be displayed. Here we will explain various stages to reach Mahasiva , namely Archana, Gyana, Vyuha and Antharyami, through pictures, and Art forms. Pushpaka Vimanam (by Novotel group) – A 5 Star hotel consists of 275 rooms with the International Convention Center, which can accommodate up to 2,500 personnel. It covers mind-blowing ayurvedic spa as well. Devlok offers Time-share option in collaboration with RCI group (the world's largest holiday timeshare company and division of wyndham worldwide) – already signed MoU - details would be discussed in-person. Floating Rama Temple, Vasuki Crazy River, Exceptional Thrills and Rides being built with visually stunning effects at world class standards. 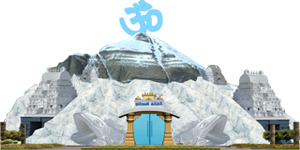 Snow Park with First ever Ice Temples (Vaishnovi, Amaranth, Chardham, Manasarovar and Mount Kailash Yatras) and Snow Restaurant. Devlok – A Divine Valley at Foot Steps of Holy Seshachala Hills. Make Every Home A Devlok. Devlok - Visit n Witness the Cultural Revolution. Devlok - Where Gods and Men Meet. Devlok - Global Brand of Tourism for India. Devlok – The Nucleus of All, That is Bharat. Devlok – The Pinnacle of Eternal Glory. Devlok – An Exhilarating Experience. Devlok – Where One Revisits the very Purpose of Human Life. Devlok – Showcase of Indian Mythology, Heritage and tales. Devlok – Become a Part of Historic Endeavor. The future belongs to those who can imagine it, Design it and create it... Devlok. 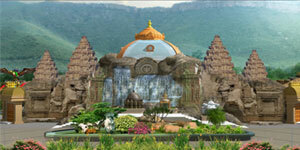 Devlok is World’s First Spiritual Theme Park Etched in the Ethos of Sanathana Dharma.